Selling your house in Fall or Winter? When the weather gets cooler, typically the real estate market slows down. Spring, after all, is the best time to buy and sell a house. However, fall the second best season to list your home. Selling your house in fall or winter is not necessarily bad timing. While we are half-way through fall, there’s still time! Even though fall and winter are slower times in the real estate world, listing your home during this time of year means less competition on the market. Homes can even sell faster during the winter, for some reason. Besides, there’s less of a need for landscaping at this time of year! 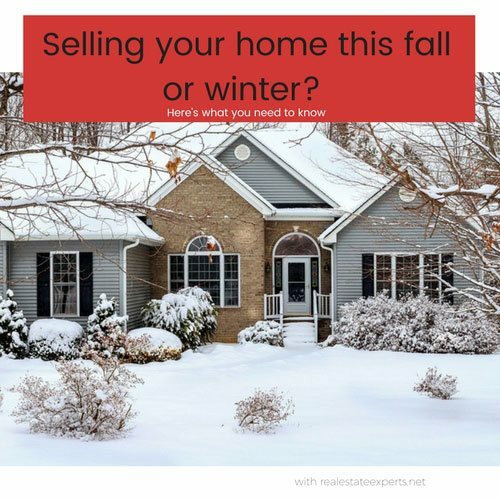 Are You Considering Selling Your House in Fall or Winter? If you’re selling your home during these seasons, here’s what you need to know. Prepare your home for showings (fall smells are wonderful, don’t burn candles, this may not be safe when you leave your home but a fall potpurri can add just the right touch. If you are lucky and you get a second or third showing, pull out all the stops and bake chocolate chip cookies. That is a lovely touch! A professional realtor is your best ally in buying or selling a home, no matter what the season. The marketing materials on your house are more important now than ever, thanks to mobile technology that allows buyers to search homes on their phones or tablets. Using professional photos, a virtual tour and using a fantastic description boosts the chances of your home selling. At Real Estate Experts, we’re ready to give your house marketing something extra. As a buyer, having a trusted real estate professional (agent or buyer’s agent) will increase your chances of winning a bidding war. With low inventory on the market, bidding wars are commonplace. Buyers agents are a buyer’s best friend in a market like this because they have sole responsibility to the buyer and can provide the ultimate amount of information. If you are interested in learning about available properties in the greater Triangle area, visit us online. Call us today at 919-813-6449 or e-mail us at [email protected] for additional information.